No one has yet captured an image of the CO2 spewing from car tailpipes. As discussed in my last post, such video images could revolutionize how we think about the copious carbon pollution (20 lbs. of CO2/gallon) we emit when we drive. 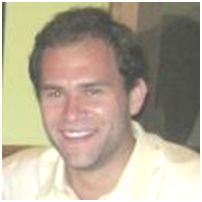 To better understand how and when we might expect to get images of CO2 tailpipe emissions, I interviewed Vic Miller, an engineering post-doc at Stanford University, and an expert in laser imaging of gases. Vic is working on a technique to image CO2 from a tailpipe (among other projects). His team’s laser-enhanced video of a match strike was recently featured in the New York Times. Q. Why has CO2 imaging been so elusive? What are the principal technical obstacles? A. CO2 is an infrared active molecule, meaning it absorbs (and emits) light in the infrared (IR). And so I’m pretty sure qualitative measurements or images of CO2 emissions can be made with currently available off-the-shelf infrared cameras that are sensitive in the mid-infrared. The tricky part is being quantitative – or getting an actual measurement of CO2 concentration with well-characterized uncertainty bounds. This is what the NASA OCO-2 satellite does – it’s a quantitate instrument for measuring CO2 concentration. The challenges lie in CO2 spectroscopy (i.e., understanding how CO2 absorbs light in the infrared, and what other species also absorb in the infrared and how they could interfere with CO2 spectroscopy) – and there are engineering challenges with making good measurements (is the signal on your detector actually what you think it is?). Q. What are the promising new techniques/technology for imaging? A. New infrared light sources (e.g., lasers) and infrared detectors are constantly being improved – these new pieces will provide access to better wavelengths (i.e., wavelengths that provide a more sensitive measurement with less interference) for CO2 detection. Q. Is it possible to measure it with non-visual means to model how CO2 would move out of a tailpipe? A. CO2 measurements can be made relatively cheaply with a capnograph. CO2 measurements are readily made in medicine to monitor patients’ respiratory health (and other conditions) – the same thing could be done near a tailpipe. Computational fluid dynamics (CFD) could be used to model and observe tailpipe emissions. Q. When do you think the new imaging techniques might be ready for providing car tailpipe images? A. We might be able to have a short little paper out in maybe a year – would like to do it in 6 months, but we probably won’t finish it that quickly. If CO2 came out of the tailpipe dark and smelly, strict controls on emitting it would probably have been in effect long ago. Instead, CO2 is invisible and odorless. We exhale it with every breath. Most of us are unaware that our cars spew vast quantities of it. In a society in which visual image is paramount, how can we show people the vast quantities of CO2 comes out of their tailpipe? How can the invisible be made visible? Much of the effort to visualize carbon has been at the macro scale, showing computer models of CO2 emissions at the planetary and state level. 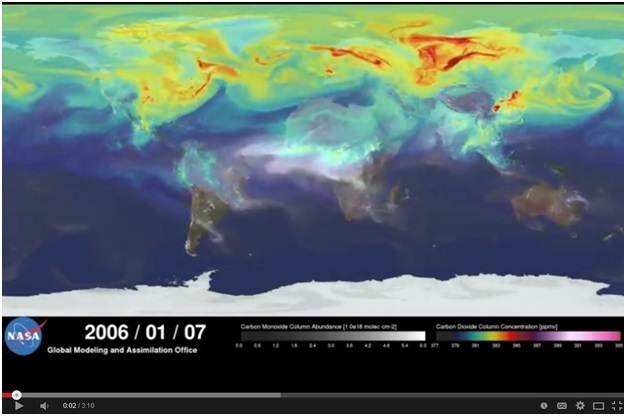 NASA recently released a video modeling CO2 as it swirls through the planetary atmosphere. Carbon visual’s image of one metric ton of CO2. 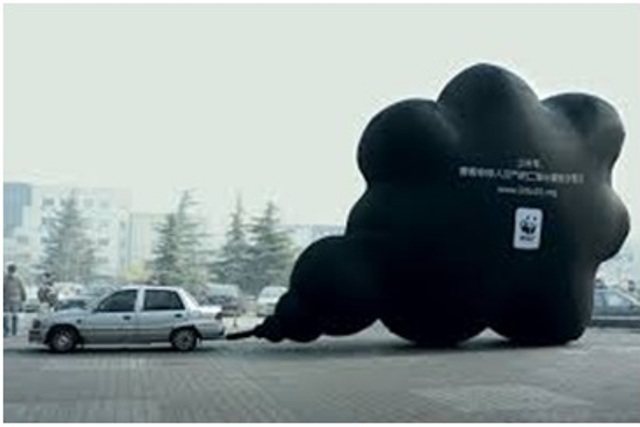 Others have also created simple, powerful visual models of CO2 pollution.Carbon visuals, a UK company specializing in producing images and videos of CO2 emissions, uses giant blue balls to show the actual volumes of CO2 being emitted by automobiles. 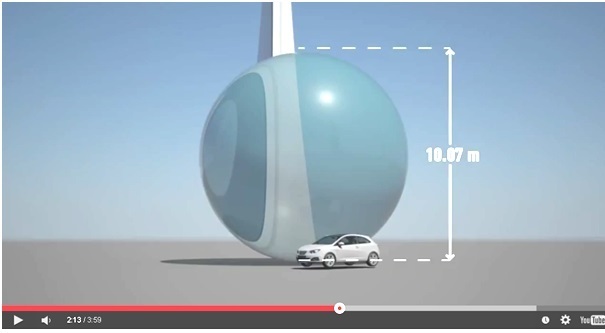 The blue ball in the photo represents 1 metric ton of CO2, or the volume produced by the average US driver in about 2 months of driving. New York City produces 54,000,000 balls in a year. All of the above images are models, not actual visual images of CO2. Imaging CO2 has been extremely difficult because of the properties of CO2’s electronic transitions. Researchers are presently working on using lasers in the infrared spectrum to excite CO2 molecules so that they can be imaged. The successful imaging of CO2 spewing from a tailpipe could lead to an important breakthrough in human understanding and consciousness, similar to the breakthroughs resulting from the first film of a horse running or the first images of Earth from the moon. The representation of CO2 need not be left only to scientists. Visual artists, actors, and poets can make the invisible visible, the unreal real, and the unimportant urgent. Our ability to reduce CO2 emissions rests largely on our grasp of our personal role in the CO2 crisis, and our resolve to minimize our contribution to the problem. Our grasp and our resolve depend in large part upon our ability to see and communicate visually the CO2 we and others emit. GAS STATIONS: AN OVERLOOKED STAGE FOR CARBON EDUCATION? The gas station is the oil companies’ tentacle into the cars and pocketbooks of consumers. Located at prominent street corners in nearly every neighborhood in the developed world, gas stations proudly carry the flag of Shell, Chevron, BP, and other oil giants into our communities. The gas station would therefore appear to be an ideal stage for educating consumers about carbon pollution and its role in fomenting climate change, and for generating friction in the normally smooth transfer of carbon from the oil company to the gasoline consumer. Despite their potential for education and advocacy, gas stations have rarely been utilized as a platform for protest, advocacy, or carbon education. Rather, with rare exception, they function quietly and efficiently as the oil companies’ community-based carbon spigot, their latent political, economic, and social significance cloaked by the numbing routine of pumping gas. Since the oil price shocks of the 1970s, most gas stations protests have been about the price of gasoline, most recently with the price spikes of 2008 and 2011. Recent protests have focused more narrowly on oil company malfeasance. On Earth Day 2010, activists in Oakland protested at a Valero station in connection with the company’s opposition to climate legislation. The 2010 Deepwater Horizon blowout caused a brief flurry of protests against BP across the country. In 2014, the pace and variety of gas station protests increased. In January, protesters in Manchester, England demonstrated against fracking outside a Total station. In August, 2014 a small group secretly disabled pumps at two Chevron stations in Vancouver, BC protesting Chevron’s actions in Ecuador and the construction of a nearby Chevron oil pipeline. Greenpeace organized demonstrations at Shell stations in Buenos Aires, Argentina and Santiago, Chile in August 2014 in connection with Shell’s Arctic drilling. 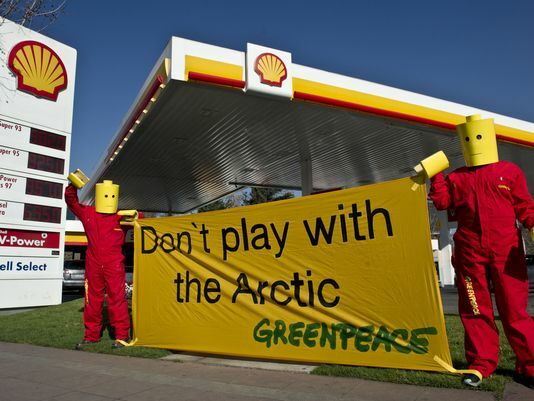 These protests, coordinated with an effective video mocking Shell’s actions in the Arctic, leveraged Lego’s product tie-in with Shell to create strong visuals and international news about the protest, and ultimately caused Lego to cancel its 50-year relationship with Shell. Gas station protests draw substantial media coverage because of gas stations’ political and economic importance in the community. Their ubiquity and prominence render them an ideal platform for climate advocacy and protest. Recent U.S. Supreme Court decisions relating to picketing of abortion clinics provide robust rights to sidewalk protesters. Coordinated, consistent, fun, well-organized, and friendly actions at gas stations could effectively challenge a broadly-accepted yet ultimately untenable aspect of American life—filling one’s gas tank at the local gas station. They would likely attract significant media attention, put the oil companies on the defensive, and help generate vigorous debate about personal and corporate responsibility for reducing carbon emissions. Platinum Polluters: The relation between carbon emissions, and income. Is there a relationship between carbon pollution and income? Do the wealthy pollute more? What does this mean for carbon policy? These are fair questions when we are asking everyone to change their consumption habits in order to fight climate change. For starters let’s look at the largest contributor to consumer carbon emissions, automobiles. Wealthy Americans will often own two or more cars. They drive more and are not as worried about how much money they spend on gasoline. On the other hand, low-income Americans tend to drive less, and are much more careful on how they use fuel. The urban and suburban poor may not even own a car, and will likely rely more on alternative means of transportation such as bicycling, walking, and public transit. The rich also fly more and take more out-of-state and out-of-country vacations. The top earners may even own a private jet. If you’re wealthy in the United States it’s also likely that you own a larger home. More square footage to your house means more space to heat in the winter and cool in summer. It is not hard to see that the wealthy consume more and therefore contribute a greater amount of CO2 to the atmosphere. If those of greater means pollute more, is it not fair to ask them to sacrifice more for the sake of the planet and our future? 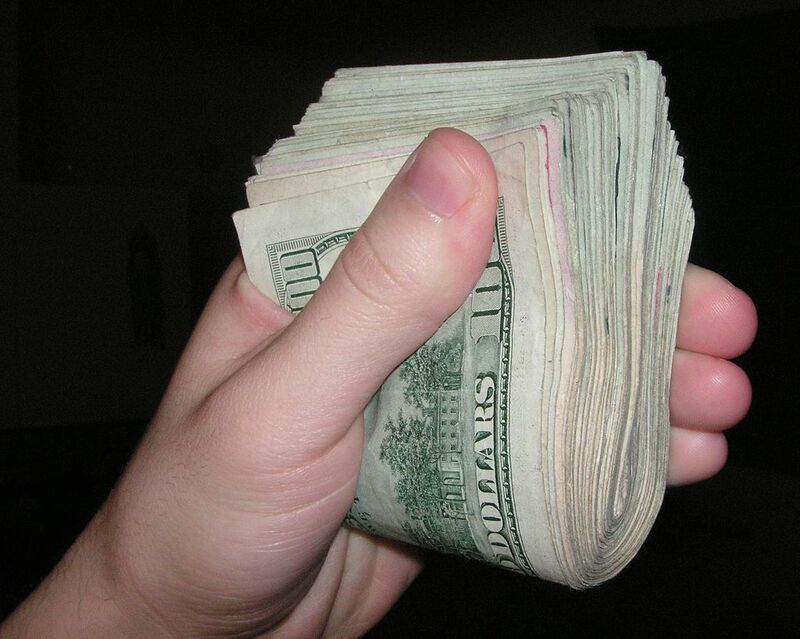 Some climate activists, and advocates of economic justice, have asked for a wealth tax. They believe that part of the revenue could be used to fight global climate change and lift some of the burden the poor will face because of it. But the amount of influence the rich in this country have over our politics makes such a proposal impossible and doesn’t address the fact that the rich will continue to pollute on a higher level. To be fair, not every wealthy individual mindlessly emits a megaton of carbon dioxide. Some of the most notable of the upper class are fierce climate activists. On December 23, Leonardo DiCaprio, a Hollywood actor with a net worth of $220 million, spoke before the UN. He proclaimed that climate change is real and that the world must act to stop it. Mr. DiCaprio is not the only celebrity to vocally state their support for the fight against climate change. Actress Cameron Diaz, singer Will.i.am, and, the richest of them all, Bill Gates, have all been active in the climate movement. There could also be campaigns where the wealthy compete for who can get their carbon emissions the lowest. They could brag about who gave more money to put solar panels on schools, as well as other carbon offsetting causes. If we could make having a low carbon footprint just as much of a status symbol as owning a Gulfstream jet, the implications could go far beyond the wealthiest among us. Everyone at least once in their lifetime has dreamed of being rich and what that could mean for them. What if that also meant being able to do more to stop climate change? At the People’s Climate March, we didn’t hear much about the role of the consumer in reducing emissions. Why? In the mid-2000s, leading organizations in the climate movement such as Greenpeace and the Sierra Club made a key decision: carbon emissions reduction by individuals was to be de-emphasized as a climate reduction strategy. Rather, organizing efforts would focus on promoting carbon-pricing legislation, blocking development of domestic fossil fuel resources and infrastructure such as the Keystone XL pipeline, and divestment from fossil fuel companies. Climate movement leaders made the decision to de-emphasize consumer carbon reduction on the assumption that consumer-oriented strategies would achieve less carbon reduction than carbon-pricing legislation, and that focus on consumers would imply that consumers, and not the fossil fuel companies, had agency to reduce the climate problem. 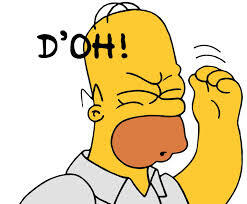 Climate leaders also believed that consumers’ willingness to act politically might be reduced if they were “turned off” or “guilt tripped” by activists asking them to cut and offset their carbon usage. The present climate strategy has achieved little. Entrenched energy interests will block carbon-pricing legislation at least through the 2016 elections, given the Republicans’ (and some Democrats’) staunch opposition to any form of carbon pricing. The public has generally shown little interest in carbon pricing or taxes, and little belief that anything they do can possibly influence a Congress receiving gobs of oil and coal industry cash. The movement’s tenuous blocking of the Keystone XL pipeline has thusfar been a success, but meanwhile development of hundreds of other fossil energy projects continue unabated, and gas prices and consumption remain stable. The divestment campaign, although slowly gathering steam, is still miniscule, and is unlikely to present a significant obstacle to fossil fuel companies for decades. While the climate movement struggles to gain traction and achieve results, ordinary consumers’ role in the climate problem has been ignored, even though consumers account for more than half of the fossil fuel consumption in the U.S. Consumers still have minimal understanding of their role in polluting the atmosphere with carbon, and no ethic of personal responsibility for curtailing their pollution. To complement its traditional strategies, the climate movement should embrace a campaign to break the bonds between oil companies and the consumers which sustain them. This campaign should seek to alter the psychology of consumers with respect to fossil fuels, by encouraging them to perceive their use of oil and coal as dirty, polluting, and incompatible with their lifestyle. This campaign can be achieved through a combination of advertising, educational campaigns, local government action, and other strategies that were used successfully to cleave smokers from tobacco companies. If successful, these campaigns will hurt oil companies where it hurts—in their bottom lines. If a consumer campaign is successful in making consumers dislike and avoid petroleum products, not only will it reduce fossil fuel consumption, it will smooth the way for achieving the climate movement’s traditional goals of a carbon tax, rolling back carbon supply infrastructure, and divestment from oil companies. Advertising and Climate: Who’s on Top? Have you ever seen a television ad or billboard asking you to cut your carbon usage? Aside from a very small amount of innocuous advertising promoting energy efficiency, the vast majority of energy-related advertising promotes fossil fuel usage. 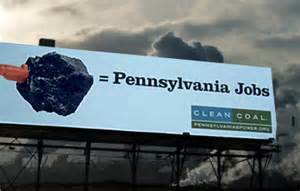 The coal industry has spent tens of millions of dollars on its “clean coal” campaign. Oil giants such as BP and Chevron and their front organizations spend lavishly promoting their commitment to “meeting America’s energy demand.” Auto companies such as GM, Ford, Toyota, and Chrysler are all among the top 15 U.S. advertisers, each spending billions of dollars annually to promote their gasoline-burning cars. Climate-denial organizations and politicians have received nearly $1 billion from the Koch brothers and their allies to advance a carbon-friendly message in the media in recent years. The combined power of this advertising explains a lot about the American public’s muddled and ambivalent attitude on climate issues. Getting consumers to accept personal responsibility for their carbon usage is a critical step in building a durable political coalition to address climate change. Consumers who are concerned about their personal CO2 emissions are likely not only to reduce their emissions, they are much more likely to strongly back carbon taxes and other climate-friendly legislation.